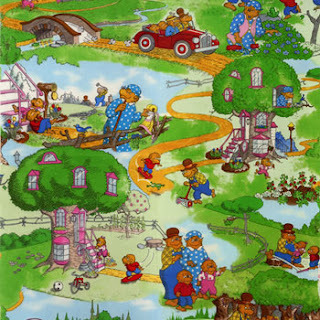 Down a sunny dirt road deep in the heart of Bear Country sits a big tree house where the Berenstain Bears are enjoying some summer fun. Join Mama Bear, Papa Bear, Brother Bear and Sister Bear for sports, arts and crafts and other exciting outdoor activities! The Berenstain Bears books have been a family favorite for generations and with over 300 titles published worldwide since the early 1960’s, these iconic and loveable bears are ready to find a new home in your quilting and children’s craft projects. The Fabrics just arrived from Moda today. I can remember as a child reading these wonderful books and we have now carried on this tradition and read them to my niece. Such wonderful fabrics and true to the colors from the illustrations in the books. Stop by and check them out at www.fabricquiltshop.com. We are currently working on putting together a kit for this fabric line that all kids will love.